Many people have asked me “Why do Air Conditioner Capacitors Go Bad?” Capacitors typically have a life as measured in cycles. While the compressor is running, the capacitor is cycling on and off thousands of times a second. So the life expectancy is directly related to the age of the capacitor. Another cause for early failure can be a variation in voltage. Power companies can raise and lower the line voltage that is delivered to your house especially during the summer during peak demand periods. This can decrease the life of a capacitor. 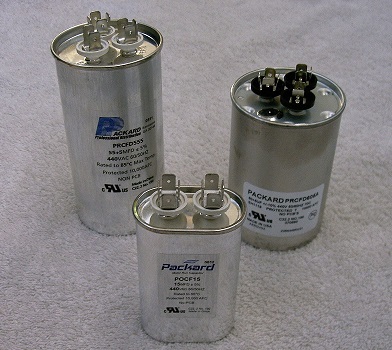 High voltage or overuse can cause the internal chemicals to boil and most of the time the capacitor looks like it has been expanded like a balloon. Sometimes they explode or pop. 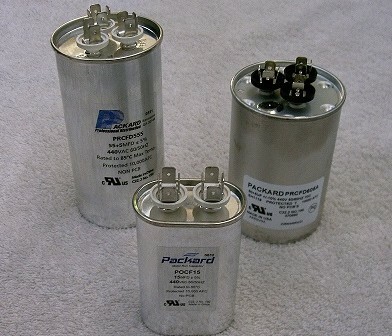 It is very common to see a large increase in the failure rates of capacitors during the summer heat. WARNING: Most of the air conditioner capacitors are connected to high voltage. Accidentally touching the terminals on a charged capacitor can release the stored voltage instantaneously and cause serious injury. So if you are wondering if your capacitor has failed, be sure to call an experienced technician to check and replace your capacitor. Also note that when replacing a capacitor, be sure to use the exact same rating of the capacitor that you are replacing. The capacitor that came with your system was selected for the right match to your motor. Changing the capacitance may cause your motor to stop working altogether.